Smoke alarm safety really rubs off with Sparky®'s temporary tattoos! Sparky Tattoos are sure to be an instant hit with kids! Bright and colorful, kids love wearing the these kid-friendly tattoos on their arms, legs, hands, feet, you name it. Moms and dads don't have to worry either -- these temporary tattoos are made in the U.S.A. with cosmetic-grade inks so they're safe, non-toxic, and easy to apply and remove! 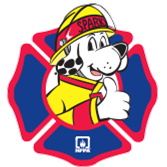 As fun as they are educational, the tattoos feature Sparky the Fire Dog® showing kids that smoke alarms are the top dog in fire safety! Order today -- they're sure to be best-sellers!